David Sousa, President, CEO & Managing Director of Bermuda Export Sea Transfer Ltd., trading as BEST Shipping [BEST] today announced that Mr. Joe Vieira, President of Joe Vieira Trucking Ltd., has now completed the purchase of the majority ownership of BEST Shipping. Joe Vieira Trucking Limited had its start over 40 years ago as Joe O. Vieira Trucking & Landscaping and was founded by Mr. Joe O. Vieira [Joe’s Father]. 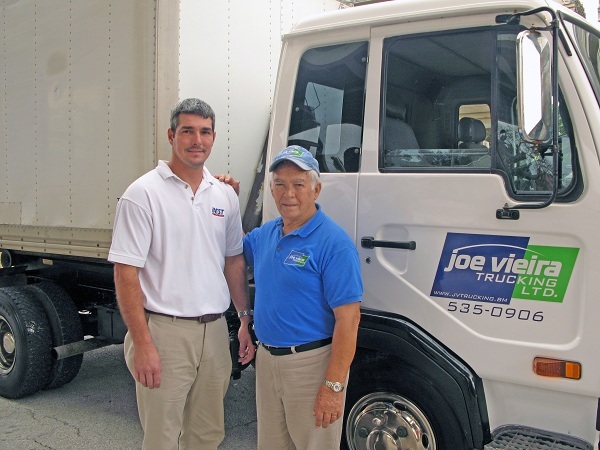 In 1995 Mr. Vieira partnered with his son who was nineteen at the time, to assist him with the running of the company and Joe Vieira & Son Trucking was born. They operated the company together side by side for many years with just one truck. Over the past sixteen years the company has grown considerably and now has a fleet of vehicles consisting of dump trucks, a crane truck and a tractor trailer. Mr. Vieira turned the company over to his son in 1998. In Dec 2010, the company became a limited liability company and is now known as Joe Vieira Trucking Ltd. The company continues to carry out local house moves, tractor trailer container haulage, machinemoves, trash removal, construction site deliveries, import and export services, house pack ups and unloads for customers arriving in or leaving Bermuda, crane truck, bobcat and telescopic forklift work and all general trucking needs that their customers may have. Congrats to the Vieira’s see what honest hard working people can accomplish. And no Joe wasn’t born with a gold spoon in this mouth, his parents made sure he worked hard. You go Joe!!! Well done Joe Vieira and family. Hard work pays off. Much success in the future! all the monies and business opening since the? Prior they the sames ones was crying down the economy and closing up their shops. Newsflash, “Follower” – this is what having pride and confidence in one’s government looks like!!!!!!! Bermuda hasn’t seen this much faith and confidence in their government in a reaaaaaaly long time!! Thanks for pointing this out “Follower.’ Way to be a leader on this blog! Thanks OBA for giving us HOPE!! Congratulations to the Vieira’s! hard work pays off! all the BEST to you – you have our full support!